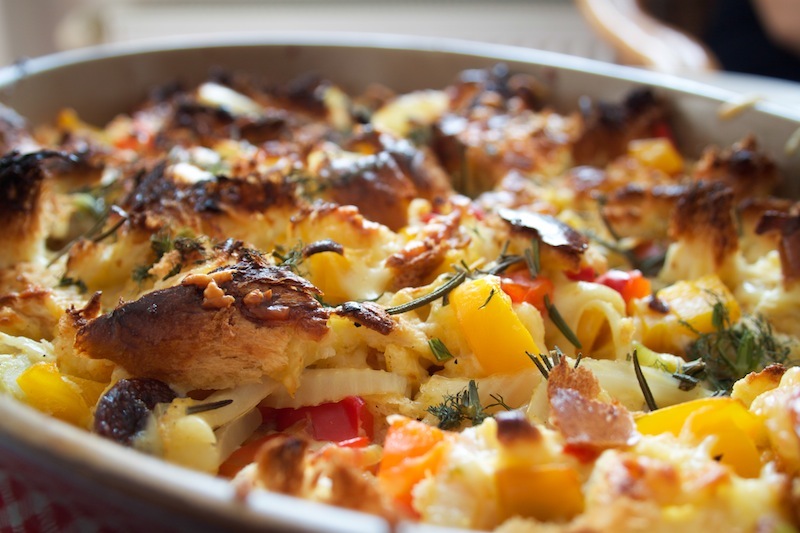 What I Took From the Woods: Pepper, Fennel and Sausage Breakfast Casserole – Eat Me. Drink Me. 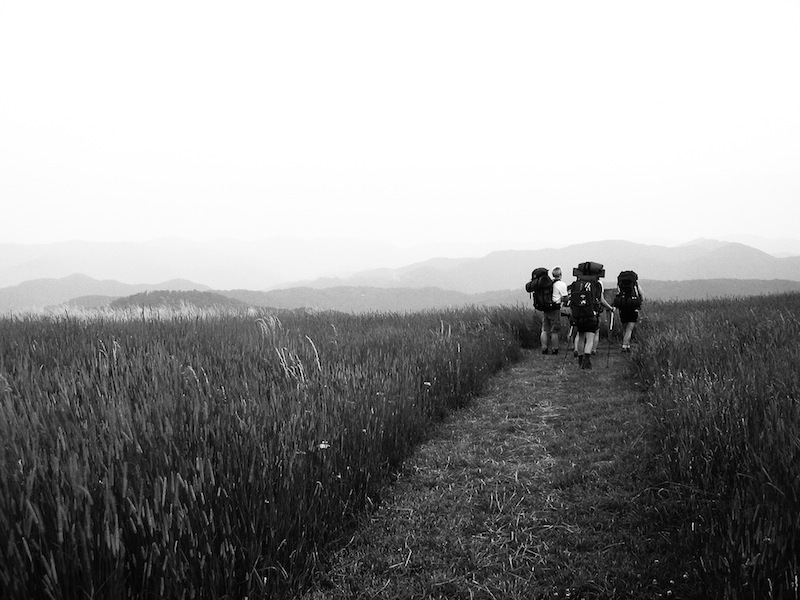 Once upon a time, I used to lead backpacking trips. Strange to think about now, after having found my affinity for cities – and big ones at that – that at one time, I gladly trekked through green forests with a pack damping sweat on my back, feet sheathed in sturdy boots, and plastic bags of trail mix stashed inside my pack. We called it gorp, short for “good old raisins and peanuts,” and individuals were severely reprimanded for what was called “strip-mining the gorp” – eating only the colorful M&Ms and leaving behind a pile of nut-dusted raisins. Each trip lasted about a week and was divided three ways. 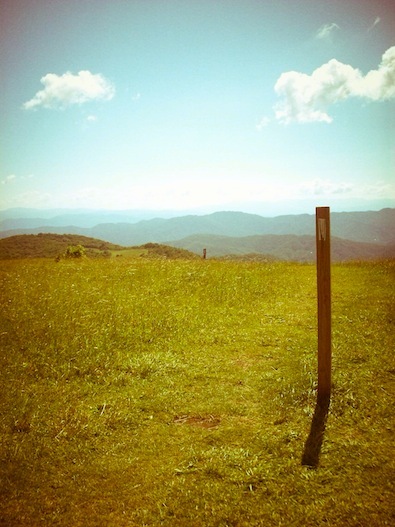 Three days were spent hiking along the Tennessee-Carolina Appalachian Trail. As we wound our way up steep and rocky paths, we’d stop to pick small wild blueberries studding the bushes or to watch a Monarch rest its wings on a cluster of flowers. 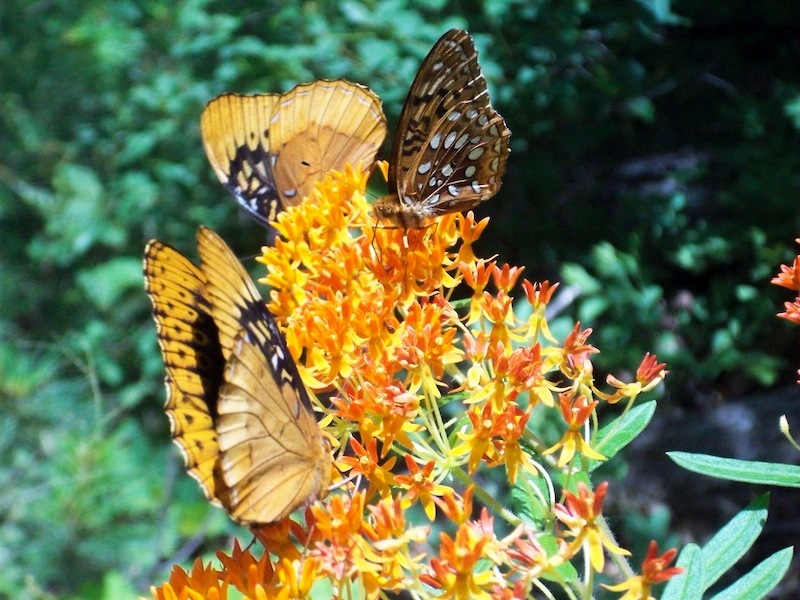 The woods were full of squirrels and chattering birds, honeybees, butterflies, and more dangerous animals too – rattlesnakes, bears, and pesky mosquitoes. We made camp near shelters, setting up blue tarps for tents, purifying water from nearby streams to drink, peeling sweaty socks from our tired feet. There were two separate routes, but both led down to the Appalachian town of Hot Springs, where dirty groups would meet at the Smoky Mountain Diner for giant glasses of tooth-shattering sweet tea, deep-fried sweet corn and okra, cornbread and warm blackberry pie with ice cream. 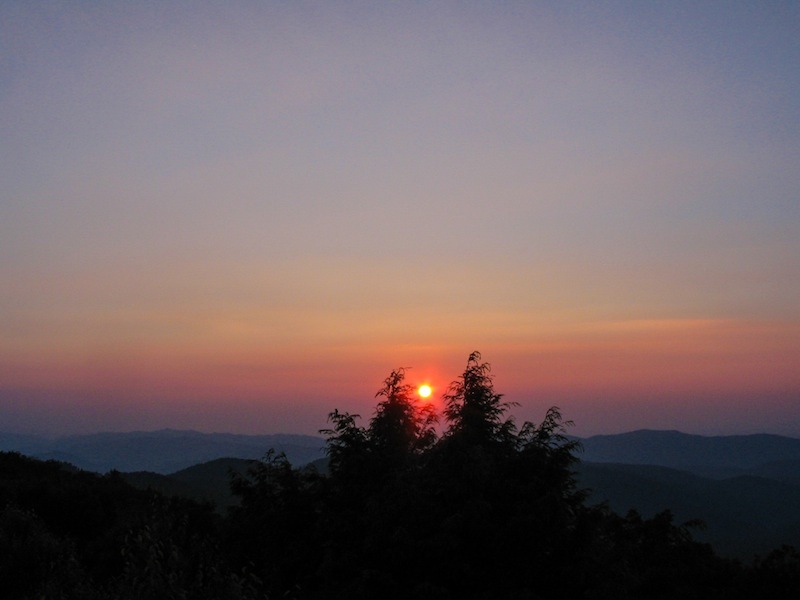 One day of the trip was spent doing a service project in the Asheville area. Some days, we’d clear forest trail of overgrown weeds, fallen stumps and stones. Others, we’d plant gardens for schools or sort cans at the food bank. Two days of the trip were spent on the river, the French Broad, fondly referred to as “The Dirty Broad.” It was a very dirty river. These were days of rest and inevitable sunburn. Lazy stretches of calm river. Hands dangling over the edge of the canoe. Sections of wild whitewater, where the canoe would roll over waves, slip through crevices of rock, and sometimes capsize, sending you bumping downstream with the current. Those days were my favorites. 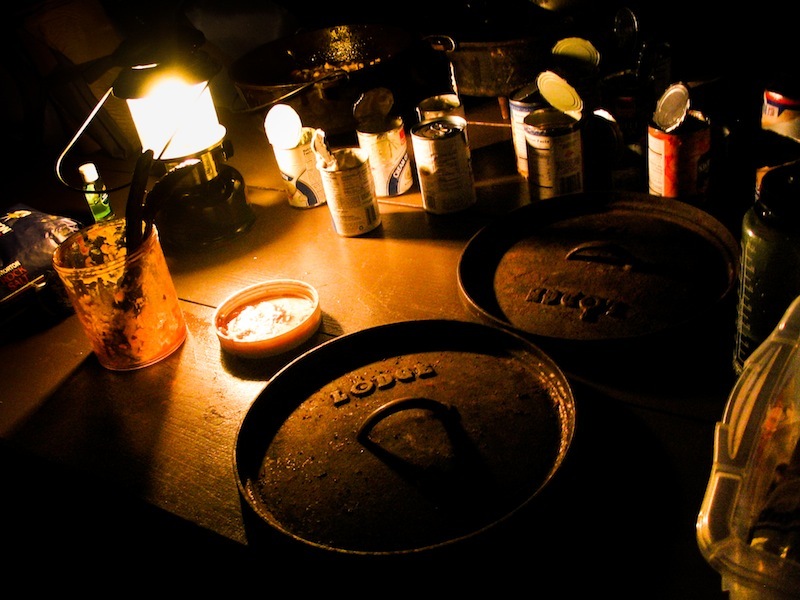 In the evenings, we’d make camp along the river, and because we weren’t carrying our equipment on our backs, the river crew would bring us a Dutch oven to cook. We’d make lasagna or chili, all of the ingredients carefully measured and labeled before we’d started our trips. For breakfast, there’d be Schorsch Soufflé, named for a trip leader who’d invented the dish years before. Schorsch Souflé called for 2 loaves of Hawaiian sweet bread, 18 eggs, 1 package of Dean’s sausage, 1 lb. 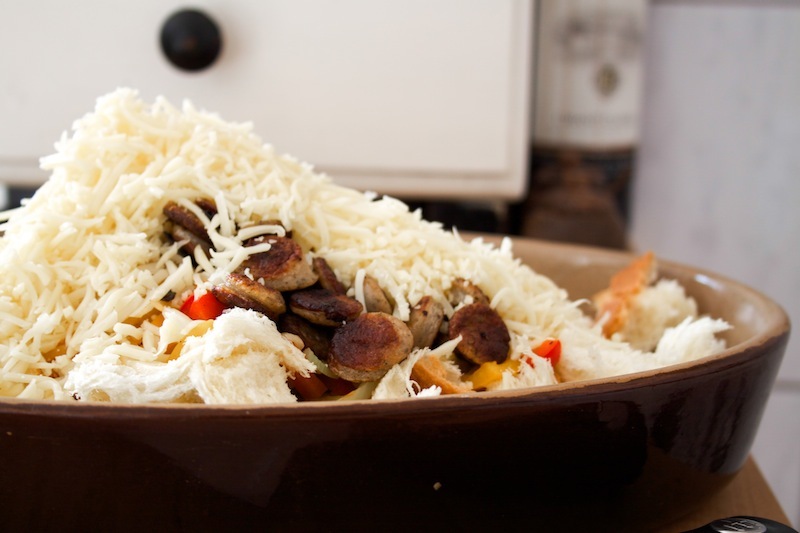 shredded cheddar, mushrooms, red or green pepper, and onion. The preparation was simple. The sausage, onions, pepper, and mushrooms were pre-cooked on a skillet. 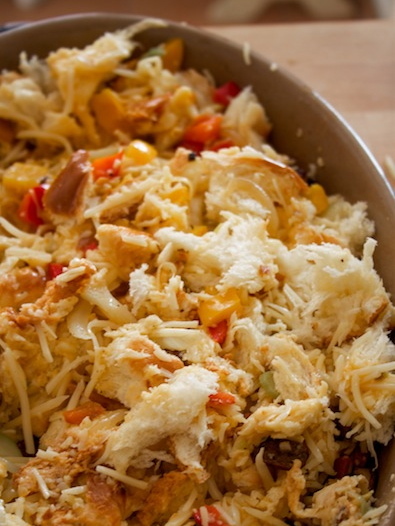 The Dutch was lined with shredded bread, topped with the veggies and sausage, cheddar cheese, and egg. While one person was preparing the soufflé, another would be firing up the coals and getting them hot. The Dutch would be placed on the bed of coals, the lid fitted snugly on top, and coals dumped on top of the lid. When the lid was lifted, we bleary-eyed wanderers would perk up to the smell of fragrant sausage and onion. We’d brush our teeth and spit into old ash pits, sit around the glowing coals, and eat bowls of sweet-salty soufflé. In the years since I have led backpacking trips, I have made variations of this soufflé on more than one occasion. It’s even become our Christmas morning brunch tradition. There’s more room to play when you’re not limited to foods that hold up well in the backcountry. I’ve made it with brioche instead of Hawaiian sweet bread, bacon instead of sausage, I’ve played with the cheeses and mushroom varieties, I’ve added and substituted vegetables and seasonings. It’s a very flexible and forgiving dish. In its most recent incarnation, I added sliced fennel bulb, fronds and anise seeds for a dark, licorice-y bite to cut the richness of bratwurst and Gruyere. Rosemary lent a fresh, herbal note. No matter how many times I make it, or how different it is from the way I had it first, my mind always strays back to those riverside breakfasts, my knees warmed by the dying coals, the rain-wet air cool against my cheek, the earthy smell of pine and dirt, and the dull, persistent rush of the river always flowing on. Hot Italian sausage is my favorite kind to use in this dish, but I have yet to find it in Germany. I used slim bratwurst as a substitute. Any kind of sausage, or even bacon, would work in this dish. 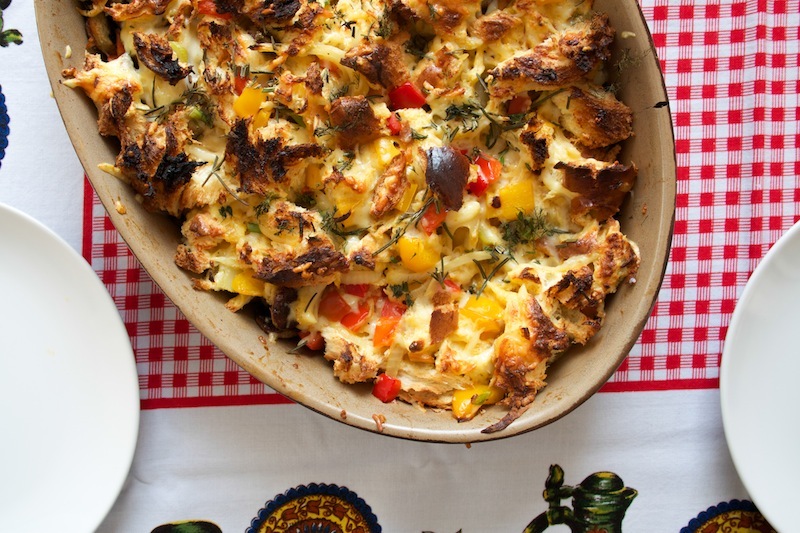 You can also substitute for the Gruyere, but make sure it’s a cheese that melts well (and not mozzarella…). Cheddar is a great choice (another German impossibility). Pre-heat oven to 475º F (245º C). 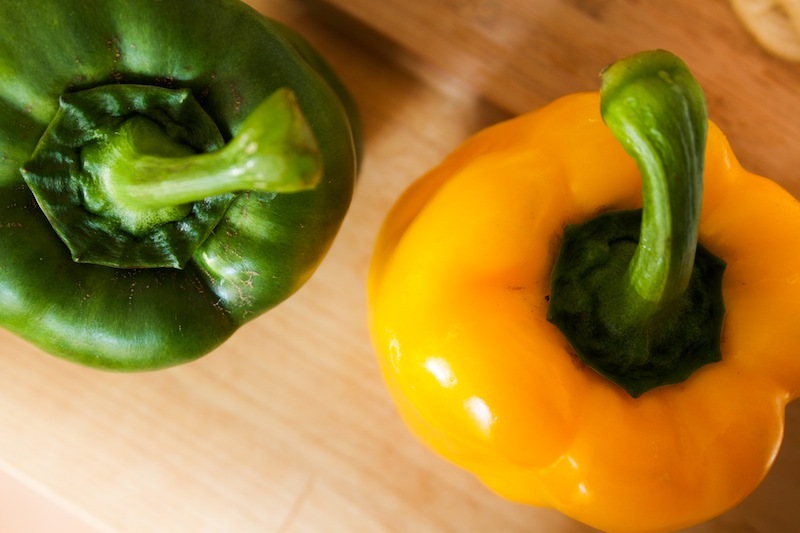 Dice onion, bell pepper and fennel. Heat olive oil in a skillet, and when hot, add onion. 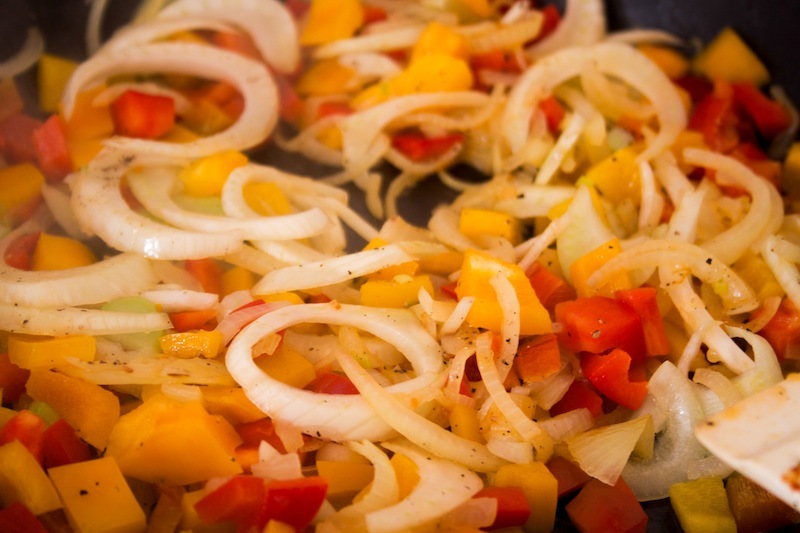 Sauté for 2 minutes, until union begins to soften, then add both peppers and fennel. Add salt, pepper, and anise. 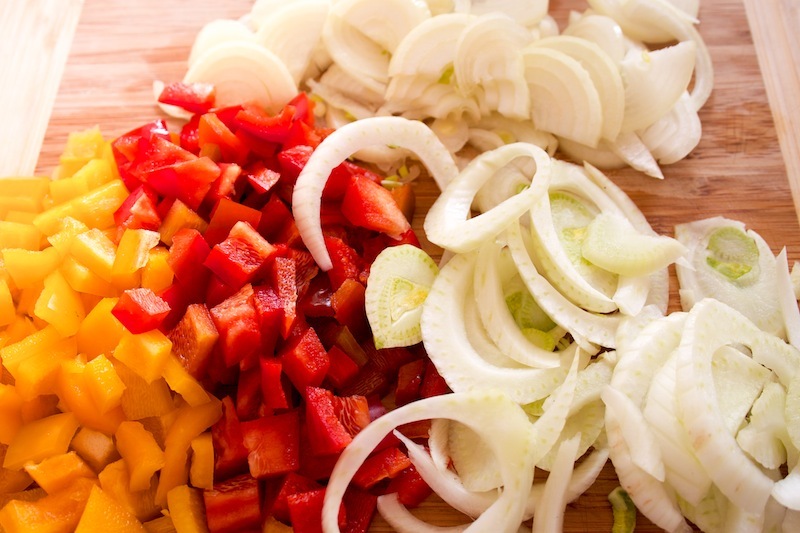 Cook for about 5-7 minutes, or until vegetables have softened, but still have a bit of bite. Set aside. Cut sausage into bite-sized pieces (method will vary depending on the type of sausage used) and cook completely through. Tear brioche into bite-sized pieces and place in a casserole dish. Tear enough so that the bottom of the casserole dish is covered, about 1-inch thick. Top with the sautéed vegetables and sausage. 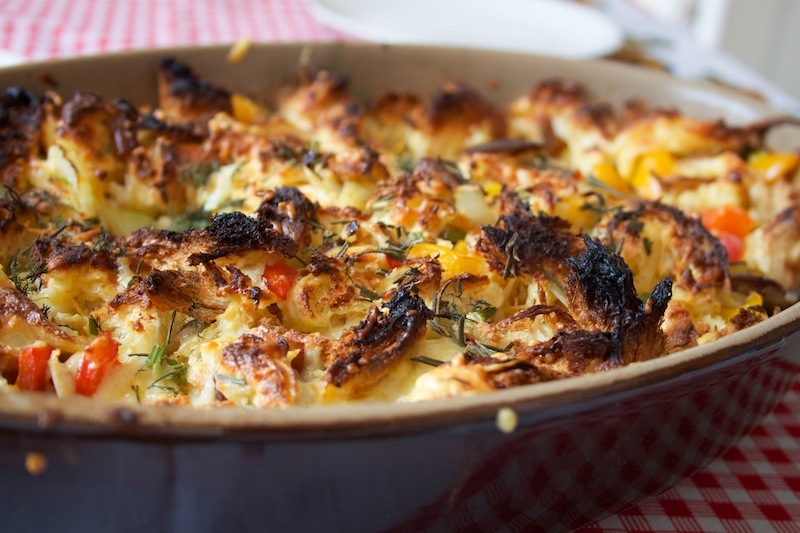 Coarsely chop fennel fronds and rosemary and sprinkle over the top of the casserole. 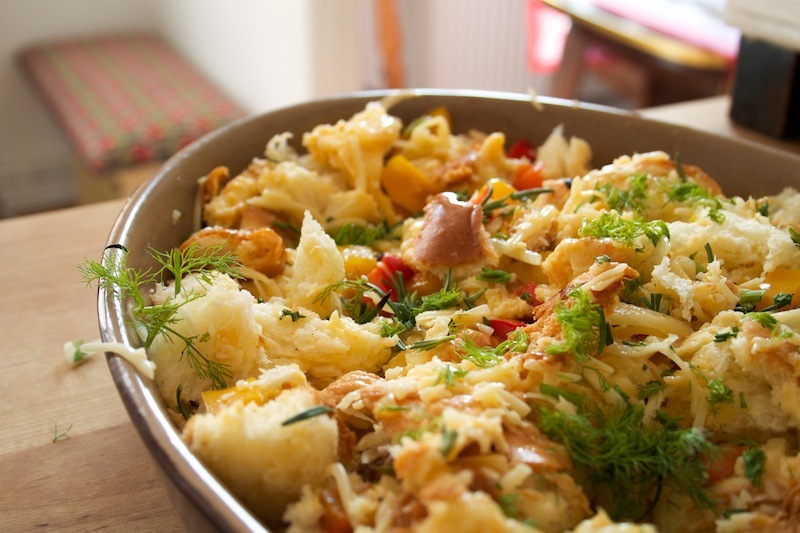 Bake for 15-20 minutes or until the egg has set and the top of the casserole is lightly browned. Top with freshly snipped chives to garnish. Best served with fresh juice and hot coffee. 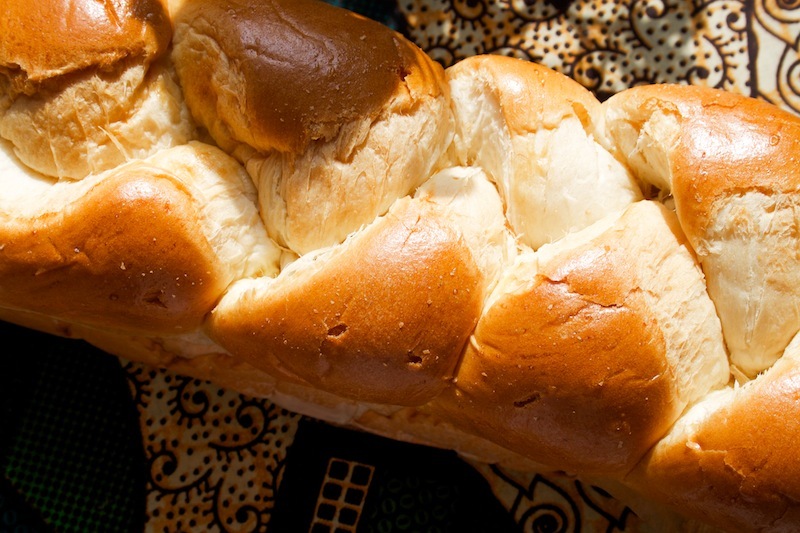 Using Hawaiian sweet bread…what a good idea! I, too, remember those days – differently than you do. I spent your whole trip praying for your safety, no broken bones, no venomous snakes or hungry bears, and admiring you tremendously. That was not the same girl who was trendy and had lead parts in high school and sang beautiful solos as concerts. This was my namesake grandchild who was so much braver than me. I love you for who you were and who you are and who you will be. The pictures are really wonderful and the recepie is so nice.